A teenage Jewish girl in Nazi-occupied Amsterdam joins the Resistance and hides out with her parents in this debut novel. This story’s prologue, set in July 1942, reveals that Rachel Klein—raised to be “a polite Jewish doctor’s daughter”—delivers papers and messages for the Dutch Resistance, and she is almost caught. Returning to May and June 1940, as the Nazis are invading the Netherlands, the tale traces the fortunes of Rachel and her family. Her father is optimistic and doesn’t want to leave his practice; her more radical mother wants to escape to England but won’t leave her husband. As the Nazi occupation settles in, people try to live normally and hope for the best while increasingly draconian restrictions are put upon Jews, which develop into violence, roundups, and disturbing tales of work camps. Rachel and Michiel Drogt, a Christian university student, fall in love, but he chooses to go underground and fight the Nazis. Seeing the Nazis in action, Rachel agrees with his decision. She’s recruited by the Resistance and begins her perilous assignments, finding courage in performing her duties. After the near capture of the prologue, Rachel determines to get herself and her parents into hiding despite their reluctance, which she manages in August 1942. For nearly nine long months they live crammed into a cellar. The family must relocate to a safer refuge, but Nazis are on their scent and closing in. 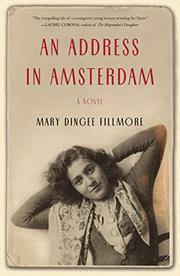 In her well-researched novel, Fillmore vividly portrays Amsterdam, Rachel, and her family. Of special interest is Rachel’s Resistance work: the details of the missions and how she handles the dangers. The author sees the complications in people and situations; though Rachel is heroic, for example, she’s also partly motivated by daydreams of her valor being acknowledged. Similarly, Fillmore doesn’t disguise the squalid conditions of the family’s cramped hiding place. At the same time, her poetic language displays Rachel’s sensibility nicely: her “longing for Michiel was still a low ache like a cello’s part in an orchestra—faint but nearly ever-present, beautiful and painful.” A bibliography and discussion questions are included. An intense tale that gives the tragedies of history a Dutch dwelling and a family name.